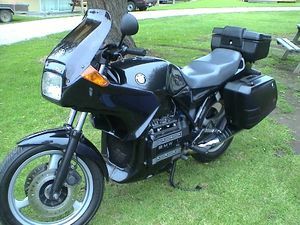 The BMW K75 was a standard motorcycle produced by BMW from 1985 to 1995. 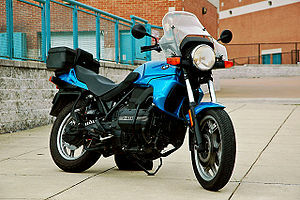 At the time of its introduction, the K75 was BMW's cheapest motorcycle. It offers a claimed acceleration of 0–60 mph in 4.6 seconds and a top speed of 120 mph (193 km/h). Various models of the K75 were produced. S and RT versions have a rear disc brake and 17 inch rear wheels whereas the others have a single leading shoe drum brake and 18 inch rear wheels. A stiffer, "anti-dive" front suspension was added to the S and RT model. Later RT version has a windshield that can be raised or lowered. Some taller riders complain of wind buffeting with the smaller S model stock windscreen. All K75 models share the same drivetrain. They are powered by a 740 cc liquid-cooled inline three-cylinder engine with Bosch fuel injection. The US EPA specific engine produce 68 hp while all others produce 75 hp. It utilizes a five-speed transmission with a dry clutch and a shaft-driven final drive. The engine is rotated 90 degrees – designed to be less vulnerable to damage should the cycle fall over. The K-series lineup, including the K75 and K100, were not just new models; these designs were radical departures from almost every aspect of previous ones. The K-bikes introduced new technology and refinement for a premium brand. At the time, BMW and Harley-Davidson were the only major manufactures that did not offer liquid-cooled engines. Competing brands, notably of Japanese manufacture, were touting the superiority of their liquid-cooled engines and had introduced low maintenance shaft-drive technology into a growing number of their models. 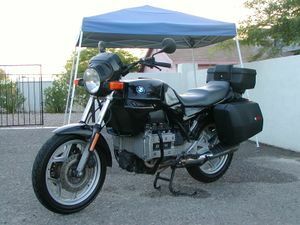 The K-series offered refinements like computer-controlled fuel injection, all stainless steel exhaust, rust-free aluminum fuel tank, anti-lock brakes or ABS, mono-lever in the rear and single shock absorber, adjustable headlight, high capacity 460 watt alternator, cigarette lighter accessory plug-in, self canceling signal lights. It would take more than two decades for other manufacturers to catch-up. The engine design had excellent vibration isolation. Two different forks manufactures were used: Showa with an outer upper tube diameter of 1.612" and Fichtel and Sachs measuring 1.627". This page was last edited on 27 November 2010, at 17:55.